Bangkok and its majestic temples rising from the mesh of busy streets are an eclectic mix of old and new. But beyond the sky highs and raucous traffic, there is another highway that traverses the city and gives you an awesome perspective of its diversity. I am talking about the grand Chao Phraya River. For as low as 20 Baht (0.50 euros), one can enjoy cruising a significant length of the river which gives access to views of Bangkok’s renowned temples and dynamic skyline. The boats start at the central pier just right down stairs from the Saphan Taksin train station. 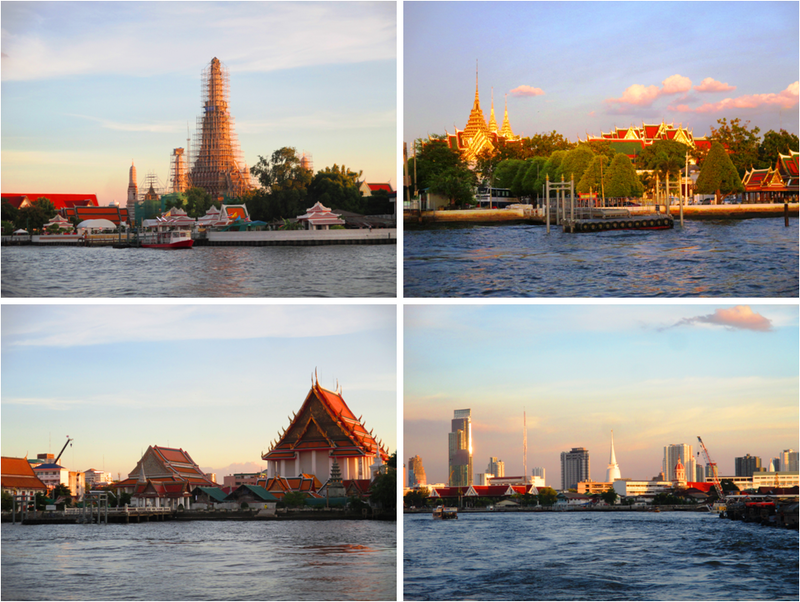 Clockwise from Top Left: The majestic Wat Arun temple under maintenance, The golden Grand Palace, The modern skyline with the standing out white Phra Borommathat Chedi temple, and The Wat Kalayanamitr buddhist temple in the Thonburi bank. Personally, I think cruising at dusk is the perfect way to do this. The intense red-orange glow of the sun at this hour harmonizes well with the glitter of the golden temples and intensely saturates the colorful hues of the buildings. Also, by the time the sun completely sets, the temples begin to light up and their reflection from the river creates stellar sceneries. You can stop by the Maharaj Pier (among the many interesting spots) for some modern riverside restaurant experience offering stunning views of the river. Skewering through the tiny alleys from there would also lead you to a dose of real Thai streets and treats if you want to really immerse yourself in the city culture. The Grand Palace is also not very far from this pier. If you really have a limited time in Bangkok, this is indeed a recommendable way to explore the city and at least have a taste of most of its wonders.